The early role Iowa played in civil rights history is being recognized by a 30-foot-tall sculpture sitting near the Judicial Building in Des Moines. The piece by Des Moines artist James Ellwanger is called “Shattering Silence.” It commemorates the 1839 ruling by the Iowa Territorial Supreme Court that granted permanent freedom to a former slave who entered the state from Missouri. The case came to light because a Dubuque farmer, who lived next to the freed man, stepped in when bounty hunters tried to take him back to Missouri. Ellwanger says he thought about that act of courage as he worked on the sculpture over a three year period. “For me it was the fact that one man, one person changed it and we have a state and a court and a country where you can do that,” Ellwanger said. “We should be very proud of that. Our children and generations after them should know these stories. They are so important as to who we are and how we function.” Grinnell College history professor Kesho Scott says the court’s decision put Iowa far ahead of the nation on civil rights issues. “I think we can be more and we can follow the example of those few good men who shattered the silence of equity and inequality knowing that freedom in this state for one is freedom for all,” Scott said. 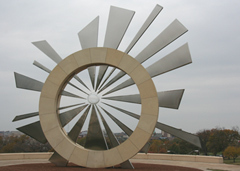 The sculpture consists of a ring made of Dubuque limestone, 16 wedges of steel that resemble shards of glass and an acrylic orb in the center. Private fundraising paid for the piece, which cost 500-thousand dollars. A dedication ceremony was held Thursday inside the Judicial Building.